Riley Street Station operated as a commuter train station from 1867-1973. However, the history of the commuter rail industry within East Aurora dates back about 30 years before that. Initial proposals for a rail line from Buffalo to East Aurora began to surface as early as April of 1832 by the Buffalo and Aurora Railroad Company. The early 1830s was a time of expansion and prosperity. And by 1884, Buffalo had become one of the most important railroad centers in the world and one of the Pennsylvania Railroad’s biggest hubs. At a time when transportation was not as easy and convenient as it is today, Buffalo and the many smaller towns served by the railroad, prospered. Much of the growth in these years had been fueled by the widespread construction of new railroads and canals. Millions of acres of public lands were sold by the government, mostly to speculators. Their hope was to purchase well-located parcels that would increase in value as the railroads and canals brought settlers and traffic into their areas. Most state governments, as well as many individuals, preferred to hoard specie (gold and silver) and to discharge debts with paper bank notes. President Jackson became alarmed by the growing influx of state bank notes being used to pay for public land purchases and, in 1836 shortly before leaving office, issued the Specie Circular. This order commanded the Treasury to no longer accept paper notes as payment for such sales. From this, a major bank crisis dubbed the “Panic of 1837” was born. Banks began restricting credit and called in loans. Construction companies were unable to meet their obligations, sparking the failure of railroad and canal projects, and the ruin of thousands of land speculators. One of the many railroad companies affected by this was the Buffalo and Aurora Railroad Company, which subsequently collapsed due to economic crisis. The Pennsylvania Railroad (PRR) was the largest railroad by traffic and revenue in the U.S. throughout the twentieth century and at one time, was the largest publicly traded corporation in the world. At its peak, it controlled about 10,000 miles of rail line. 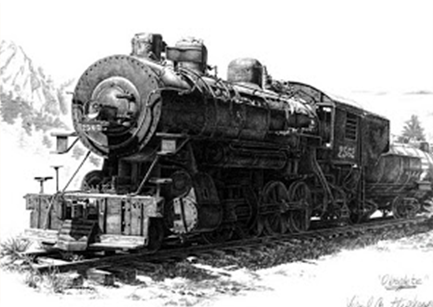 During its history, the PRR merged with or had an interest in at least 800 other rail lines and companies. The budget for the PRR was larger than that of even the U.S. government and they employed approximately 250,000 workers. The structure for Riley Street Station was originally built in the late 1880s and constructed entirely of wood. However, the building itself was considered to be rather unsightly and was a source of public outcry within the community. East Aurorians called for a redesign of the bustling station, wishing for a new more aesthetically pleasing appearance. Something that would much better represent both the image and appeal of the community. After years of complaints, the Pennsylvania Railroad finally caved in to the pressure and built a new structure in 1917, the same structure that currently houses the business. The building was built in an English Baroque Style Architecture, a design that the village felt better represented the town and would serve as the welcoming image for the travelers coming to and from East Aurora. At Riley Street Station’s peak, there were 18 Passenger trains a day going in and out of East Aurora, with approximately 300 passengers a day that traveled to and from the city. However, as the development of the automobile took full swing in the U.S., the demand for rail travel drastically fell off. The investments seen in the system prior were now to be allocated to developments of roads and super highways. Eventually the trend was too much for the local passenger trains to compete with and finally PRR closed the doors at Riley Street Station to the public for good. The last passenger train departed the station on December 31, 1973, taking with it over a 100-year history of commuter rail service in East Aurora, effectively ending a monumental era in American history. For the next 13 years, the station spent time functioning as an array of small businesses, such as an ice cream parlor and a toy store. None of which ever took hold. Prior to Riley Street Station’s inception in 1987, the building had been vacant for several years.